The chapel of the SS. 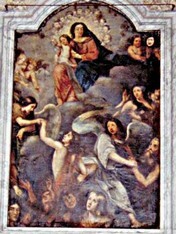 Souls of Purgatory was devastated by a fire in January 2004.The altarpiece was destroyed and replaced with the painting we see next door It is a reproduction of a painting that adorns the apse of the monastic chapel inside the Monastery. The paintings of the monastic chapel are the work of the monk of Finalpia Father Leandro Montini (+1958). At the center of the painting, reproduced here, dominates the Crucifix, as it has remained in the heart and in the eyes of the Church. 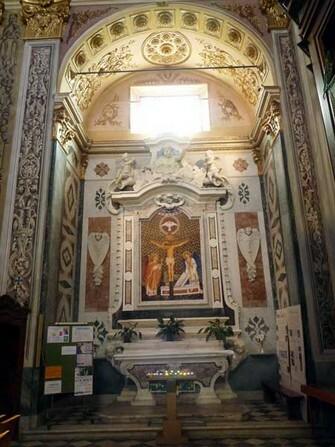 the central part of the apse of the monastic chapel appears. The Crucifix with the two Angels can thus be better seen. that come out from the side of Christ, pierced by the soldier's spear. WHY THE CHAPEL OF SOULS? of whichyou can see the reproduction on the right. This picture explains the reason for the dedication of the Chapel. surrounded by a crown of angels.